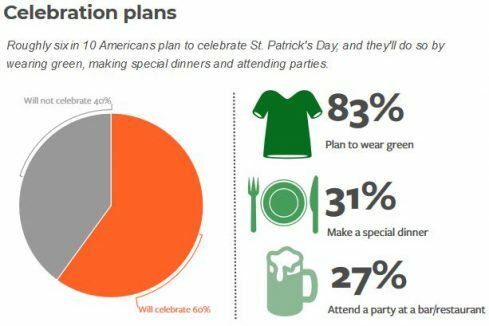 Americans will spend about $5.9 billion this St. Patrick’s Day, according to the National Retail Federation, which conducts an annual survey on such spending in conjunction with Prosper Insights & Analytics. That comes out to less than $40 per person on average, which is about half of what people spent on Valentine’s Day last month. Not surprisingly, the holiday is most popular with those between the ages of 18 and 24. But people between the ages of 24 and 34 spend the most money on the holiday, according to NRF. Yes, a lot of the spending is on booze, and especially beer. Between St. Patrick’s Day and March Madness, this is the busiest month of the year for sales of the beverage, according to Food & Wine. Guinness beer in particular surges in popularity more than eightfold, according to statistics compiled by WalletHub. Revelers put away an estimated 13 million pints of Guinness on St. Patrick’s Day. Of course, if you drink some of that at home, you will save a bundle over what you pay for it at a bar, restaurant or club. You might be able to cut corners with an all-you-can-drink special — especially if you start looking for those deals before you’ve had anything to drink. Otherwise, consider pacing yourself if you want to save money on the holiday. For other money savers on St. Patrick’s Day, check out the deals that Groupon and Living Social have listed in your location. Plus there are about a dozen and a half different retailers discounts on Offers.com, including a number of food items that are dyed green for the occasion. Readers, what kind of plans do you have in store for St. Patrick’s Day?